Worried about the safety of your tech gear while on the road? Check out the new battle-ready hard drive from LaCie. Designed by Neil Poulton, an award-winning Parisian, LaCie's Rugged Hard Disk line of drives are MIL compliant, which falls under a series of standards set by the U.S. Army's Developmental Test Command to gauge how well a device will perform under extreme conditions. 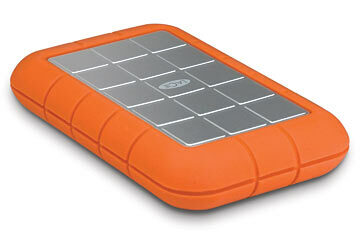 In other words, LaCie's rugged drive won't skip a beat no matter what you  or the baggage handler  throw at it.